With my husband and I working so much these days, Easy Meal Prep meals come in handy. Everytime I make one, I just take another out of the freezer to defrost. Tonight's easy meal prep meal, Beef Satay, was paired with one of my favorite go-to Rachael Ray side dishes - Sesame Green Beans. I also made some brown rice to go with it. 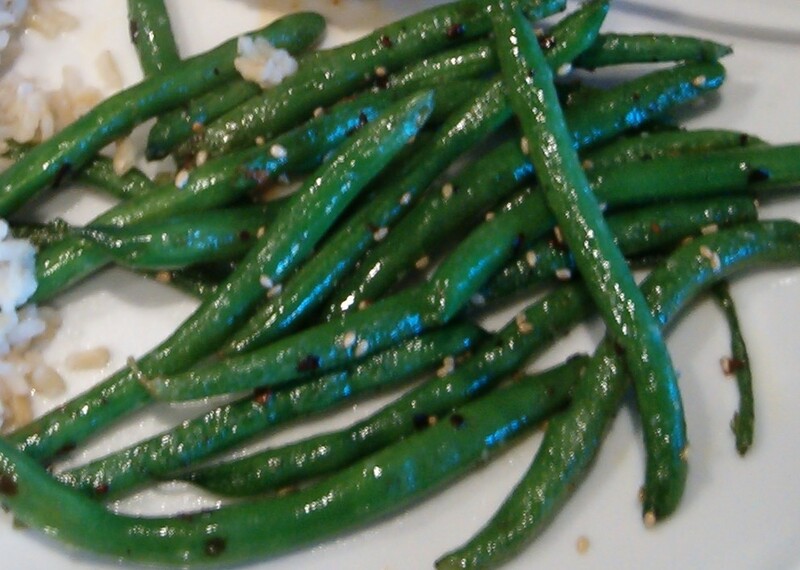 These green beans are so easy that they are a confidence builder for me. I can actually imagine making them from memory, without a recipe, which is unheard of for me! I admire those of you who have the cooking skills and experience to look in a fridge and make something without Rachael Ray to rely on. But, I am simply not there yet. I don't change a thing for this one, except I cut it in half. My only piece of advice is make sure you really take the green beans out of the boiling water after two minutes, or even less, otherwise they will be mushy. This is one fun idea for a blog. I live in France (and am a fellow Growers and Grocers writer) and hadn't even heard of Rachael Ray (shame, shame...)until this summer in the USA. Despite this, it sounds like our blog quests are similar because I am interested in how to make quick, healthy family meals while working, raising a family, and doing some writing on the side. Betty - welcome! What a shame that you did not hear of RR sooner, but well worth the trade-off for living in France. I am addicted to watching the Tour de France, by the way. GO FLOYD! If you are into quick, healthy meals, RR is your gal. Although, in the interest of full disclosure, I often have to tweak her recipes to get them to be healthy. It is always nice to find a kindred spirit out there in the blogosphere. I look forward to being a fellow G and G writer with you. Wow that looks delicious and easy! I will definitely try that one! thanks Madeline! Carrie - I hope you end up liking it!